Surrounded by luxury with a bit of nature, you will not find a more beautiful looking community than Oklahoma City, Oklahoma. With a bustling urban city mixed with the serene of the outdoors, there is something for everyone. The city is the largest in Oklahoma and is approximately 3 hours from the Dallas-Fort Worth metropolitan area and is part of Frontier County region of the state. There is a number of homes with varied home plans available in Oklahoma City, OK for sale with pools. From the modern to the classical, each style of housing will more than suit the interested homebuyer’s tastes. Many of these beautiful homes are located close to the downtown area, providing a rich source of entertainment that the family is able to enjoy. If the homebuyer is interested in quieter, more remote areas, more upscale housing is also available in those areas, providing large yards and multi-tiered houses, and a large pool with personal spas. 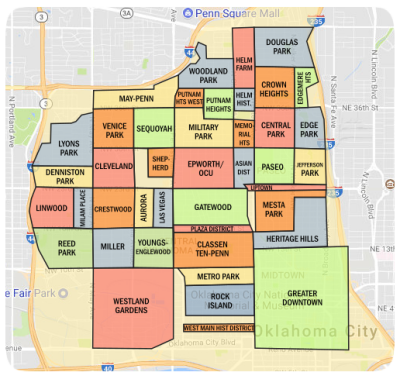 In these areas, homes typically begin at approximately $600k; however residents enjoy the finest living Oklahoma City has to offer. No matter which area of the city one chooses to settle in, one can find no shortage of things to do in Oklahoma City. Oklahoma City has a variety of attractions for residents as well as tourists. The city has undertaken several renovations particularly in the downtown district. There is a new baseball park, a central library, renovated civic center, and convention center. Those interested in sports will be glad to know that they can catch a game at the Chesapeake Energy Arena, home of the OKC Thunder. The multipurpose arena often has concerts and sporting events. Oklahoma City is home to a variety of other sports teams including the Redhawks and the Barons. There are several other arenas and stadiums in the city such as the Cox Convention Center, Taft stadium, and the Chickasaw Bricktown Ballpark. The city is the host of the annual Big 12 Baseball Tournament and also is host of the annual Bricktown Showdown Triple-A Baseball Championship game. A water canal has been added to the downtown Bricktown entertainment district. Take a water taxi through Oklahoma City’s downtown Bricktown neighborhood. Enjoy a relaxing day at Lake Hefner, located in northwest Oklahoma City. The Myriad Botantical Gardens in downtown, home to the Crystal Bridge Tropical Conservatory provides a nice scenic getaway for your family from the busy life of the city. There one can find tropical plants and flowers, giant palm trees, and exotic animals. 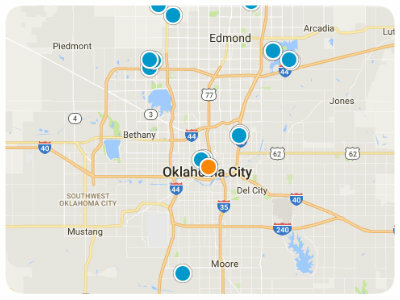 Houses with swimming pools in Oklahoma City, OK are attractive options for families. Those with aging children might take note of major universities in the area including the University of Oklahoma, Oklahoma City University, and Oklahoma State University. Oklahoma City contains the state’s largest school district, the Oklahoma City of Public Schools. The Classen School of Advanced Studies and Harding Charter Preparatory School are nationally ranked near the top of Advanced Placement schools. Oklahoma’s best and brightest in the fields of mathematics and science attend the Oklahoma School of Science and Mathematics. The city has a multitude of employment opportunities available, particularly those seeking a career in technology, and has educational resources available to those who pursue it at schools such as the Metro Technology Center and Francis Turtle Technology Center.